Hope to shed a little light on the confusion surrounding the different types of air line fittings that are available on the market. I often ask customers what fittings they are using so we can supply the stapler/nailer with the correct fitting ready to go – often the reply is very confusing, they know what it looks like but cannot identify the type. Let’s give it a go and try and give a little clarity. The quick release coupling is quite simply a means of quickly disconnecting an air line from air main or compressor and at the business end disconnect from air tool or equipment. The couplings have a shut off valve inside so when the male fitting is removed, the air flow is immediately shut down. The most common thread sizes are ¼” BSP and most of our tools have a ¼” BSP thread enabling the fitting of the male plug. This type of male plug is released by twisting the cap on the coupling and simultaneously twisting the hose to facilitate the disconnection. 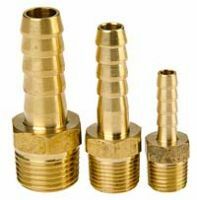 This type of male plug is simply disconnected by pulling back the collar on the coupling whilst holding the air line or tool connected to the male plug. Please note not holding the air line may cause the line to whip as the compressed air escapes. This type of Standard Coupling is a single action coupling designed for use in fixed applications such as compressor or air ring main. 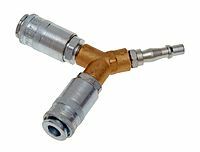 Used with the same male plug as above the Standard Vertex PCL coupling is a double action coupling which has been designed for use with trailing hoses. The protective shoulder is designed to stop the ingress of dirt and the accidental disconnection when lines are pulled along the ground or work bench. Pull back the sleeve and the pressure will automatically vent via the body. Used when you wish to split one line into two and is available with either Standard or Vertex Couplings. Another single action disconnection where the collar on the coupling is pulled back to release the male plug. This is the most common fitting we see on imported tools and air compressors. 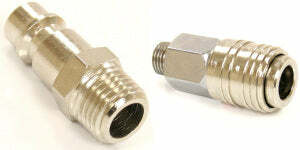 Hose tails can be connected to couplings to enable fixing to air lines – tail sizes vary to fit different internal air line diameters. There are many other types of fittings but I just wanted to cover the most popular fittings we come across and at least with a few images you may be able to identify what fittings you require. Hope this was of some assistance.